Ripple may have found a short-term top and there is potential for a sustained pullback in prices based on price action. It is trading around the $2.62 level at the time of writing from hitting a record high of $3.84 yesterday. 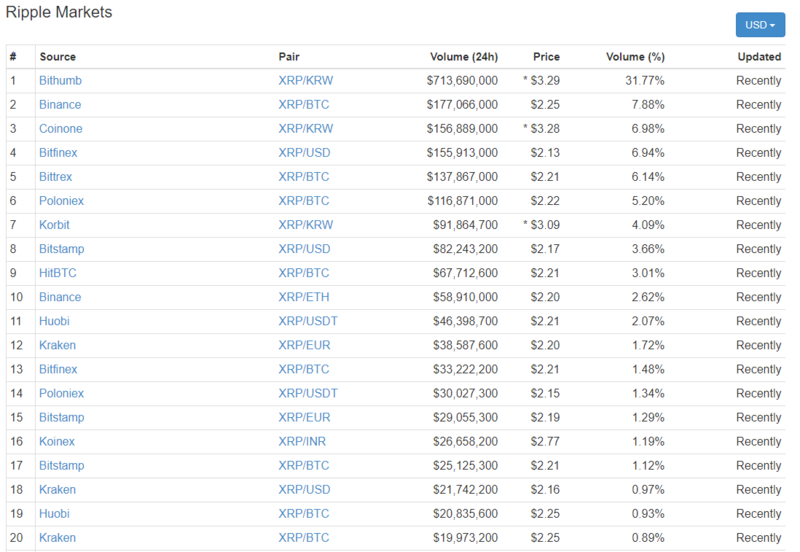 The top ten markets for Ripple shows that the fall from the yesterday's high is mainly due to losses in the Ripple Korean Won pair. There will have been profit taking as well of course after such a massive gain. Someone on the IG forum commented that they wanted to go long as soon as Ripple was available and I hope they did not. The price action was not supporting a long trade when Ripple appeared on the IG index. I have been monitoring it for the past day and I could not see the long trade on. Whilst the price action looks a bit toppy to me, the technical charts indicate there is scope for a deeper pullback. At present the doji candle is indicating a bit of exhaustion. There is a potential bearish doji reversal. A close today below $2.512 (previous day's low) could possibly indicate a short term bullish to bearish trend change. The relative strength index (RSI) shows overbought conditions. Looking at the 4 hour chart for Ripple there seems to be bearish price RSI divergence (lower highs on the RSI) and falling tops as represented by the descending trendline on the price chart. Now the rising trendline could offer support at $2.35 levels. I think if it closes below around the $2.51 area could lead to a break below the $2.35 which is the rising trend line support on the 4 hour chart. I worry that Ripple could then try and test support at around the $1.77 level which would be around 50% Fibonacci retracement and the low of 31st December of around $1.61. Is ripple available on ripple? Sorry. I mean if ripple is available on IG? Yes Ripple is available on IG under the Cryptocurrency section where Bitcoin, Ether and Bitcoin Cash are. I think it's still not available for Singapore market. James (IG Community Manager) has responded to this matter on another post. In a nut shell, there are a few things that need to be signed off from the dealing desks in Singapore and other countries which means a slight delay in Ripple being available for them to trade. Coinmarketcap is showing average prices across all the major crypto exchanges, the interesting thing when you click on how the pricing is made up by exchange is that there is wide differences the same crypto currencies are traded at on different exchanges. I had assumed that the crypto currencies, as a "global currency" would tend to rapidly equalise in price (aside from temporary wide swings during short term liquidity crises) across the major exchanges because price differences would be quickly exploited by people buying from one exchange and selling on another. But in practice not all exchanges are open to trading to people in all territories, and in particular Korean's seem to be very active in buying and selling crypto currencies but the exchanges like Bithumb are only for koreans with fairly strict controls on accessing the exchange and possibly also with export controls on capital. Coinmarketcap is converting pricing on these exchanges into the equivalent USD price but in fact it's really quite hard for foreigners to buy on the exchange and could be hard to convert back from KRW to USD. I presume there is leakage and the price differences are being exploited by someone but they are obviously not easily exploitable hence Ripple or Bitcoin price can vary quite significantly between US/EU and Korean exchanges for extended periods of time. Ripple was being heavily brought in Korea (I think there was some announcements about Korean banks trialing it) and remains at a significantly higher price USD equivalent price on Bithumb than on the exchanges that support buying and selling directly in USD. The same has also been true of bitcoin price. I'm sure there may be other reasons why the IG price doesn't match the averaged coinmarketcap price, but this does appear to be a major one. Obviously IG is working in euros/USD not korean won and uses the exchanges that are available to people outside of Korea. hi - great description, and that's exactly whats happening. The markets are effectively not efficient enough at the moment for their to be a single price. All cryptos change on exchanges, however due to the geographical location of all exchanges, a number of real world effects come into play. Countries where there are strict capital controls, or a monetary policy which can been seen as manipulative, or a country with a closed currency is going to have significant price discrepancies. trend follower your analysis looks correct. price looks to test December lows. would like to see your analysis when price action suggest a reversal. The chart for Ripple short term is not looking good. However, the smart money right now would be shorting it. In terms of trend reversal, the price action is not currently supporting such a move. For me the positive price appreciation has stopped for the moment at least. Right now the crucial point is whether Ripple is in a high-level consolidation. For those new traders what I mean by this is whether Ripple is in a basing pattern after such a monumental rally. Now this could just as easily lead to the all time high recently created or it could be a much larger correction currently occurring. Since around the middle of December, I think there has been two shortish consolidation periods result in a break to new all time highs. If the current price behaviour is similar then Ripple could break out at any time. For me a breakout above around 3.31 would confirm the high level consolidation scenario whilst it falling below around 2.15 would demonstrate that a more bigger fall was occurring. I think the 38000% price increase is just staggering and surely logic would dictate Ripple needs a break. However, in my opinion any breakout to new highs could find a lot more buying, especially with the media interest. I would just advise not to pay too much attention to the media and focus purely on the price action. I am keeping an eye on Ripple to see if a more larger pullback happens. on the 3rd jan the bulls showed signs of exhaustion followed by 3 bullish consecutive candles indicating a reversal that we see now. price has been floating around the 1.90 as of this posting. it is also the price where the bulls found support end of december. could this be the resistance the bears finally reach? Well Ripple is around $175 at time of writing. Clear trend reversal and downtrend in play. On balance of probability I would choose to short Ripple as the odds for a short trade being successful would be better than a long trade right now. Lots of people do not realise that as none of us can predict the future then our trades will merely reflect our assumptions. It is all about probabilities and the odds being in your favour. Charts will help us make a decision but they cannot tell us precisely what will happen next. Charts are based on historical price behaviour but the success of our trades is dependant on future price behaviour. Ripple is looking ugly at the moment. I have heard people on the IG Community talk about going long but I would seriously urge caution and wait for confirmation of a trend reversal before doing so. I want to bring your attention to the 4th Fibonacci extension level at around $1.92. For me the sellers are in the driving seat. A simple Fibonacci correction tool shows that prices are at the 78.6% level and that’s close to an 80% correction from last week’s highs. This should be a concern for any potential buyers who are looking to go long. I think day traders should wait patiently on the sidelines until a clear trend reversal appears but bearing in mind that last week’s bull candlestick was 98% above the upper BB. This correction was inevitable and if I want to go long then I would need to see prices closing above the 61.8% Fibonacci level at around $2.24. Love the Fib dimension, would be shown even better on a posted chart. Good stuff. I am looking at Ripple very closely. I think traders should embrace any correction which we have just witnessed in Ripple. It is a very healthy sign and in my opinion an important part of a bullish trend. I therefore welcome corrections and I certainly do not fear them. I am normally more fearful when corrections do not occur in bullish trends. I think my views come with experience. Momentum can be a key factor when trading cryptocurrencies. For those who are interested, MACD, is a momentum indicator that used the crossing of a single line in order to determine whether bullish or bearish momentum is influencing the trading action in a cryptocurrency. 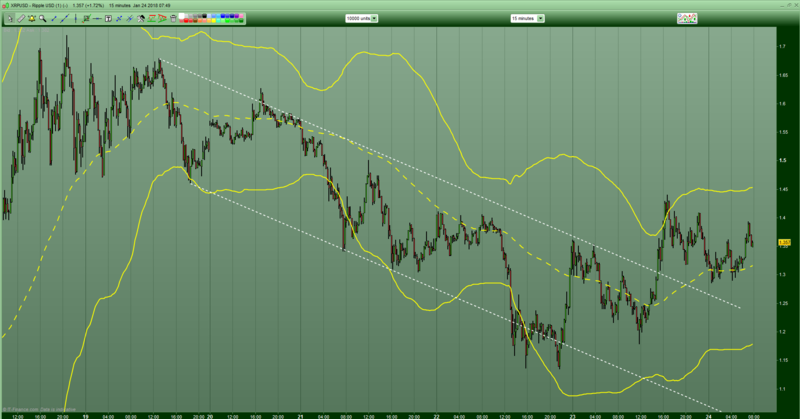 In my opinion without strong momentum a sustained move in either the long or short direction just cannot occur. A couple of days ago a bearish MACD cross was generated. This to me suggests that bearish momentum was influencing the price action in Ripple. I think prices will continue to correct until there is a bullish MACD cross. That may be a good time to consider changing from a short position to a long position so that you make profits regardless of whether the price is going up or down. I know Caseynotes and others use Fibonacci retracement numbers. These are a very popular technical took to help you identify counter-trend price objectives. In theory when Ripple's price stages a correction within a bullish trend, the price will correct around the 50%-62% of the move that preceded it, before the bullish trend reasserts itself. So based on this I would not be surprised to see Ripple drop to around the $1.40 level or even possibly lower. I think once this correction has concluded then Ripple will go on to test its all time high and possibly make new highs as long as positive news is released with regards to partnerships, uses and new applications. Your wildcard with ripple is scarcity..... or lack of. James (IG Community Manager) has encouraged us all to share trade ideas with each other within the IG Community. I am merely presenting my views, opinions and thoughts. We absolutely cannot say what will definately happen going forwards but we do know exactly what has happened in the past. I accept past performance does not necessarily guarantee what will happen in the future. However it can offer us the ability to make predictions and that is all they are. Those who are very good at mathematics and statisitics can then try and work out probabilities and odds of a trade working in your favour based on trends and historical price behaviour and studying patters. Do you have any ideas of a particular way to trade Ripple to ensure you minimise your losses and maximise your profits? I right now would not be even looking at a long position on Ripple until it breaches the $215.00 area and is approaching the $220.00 area. What would you suggest as a possible trading strategy on Ripple? Do you have any ideas on how to trade Ripple successfully now? When looking at Ripple, it seems it has been trying to hold the uptrend line. As Oilfxpro would say, "Buy the dips". To me it looks like there is buying at around the $1.50 level. By my calculations the Fibonacci retracement levels are around $1.76 and $1.40 which are the 50% and 61.8% of the recent rally from $0.22 to $3.31. I still cannot see any reason to go long just yet but it is $2.00 at time of writing so I will be getting very interested if I see $2.15 - $2.20. Well the Fibonacci retracement levels have been blown to pieces! Value traders / investors may appear. There maybe a false recovery and short covering amidst the madness. Ripple is up 13% at time of writing from mammoth correction / drop that we have all witnessed in the past 24 hours. The real question is at what price would you look to enter from here and is there more decline to come. I think a push above $1.40 levels could see a lot of buying. there is still a clear bearish trend in xrp and btc with no signs of an end to the trend in my opinion. Alot of the altcoins seems to mirror btc suggesting it be the bellwether for cryptos. once btc shows a clear sign of a trend reversal or coinbase decides to add xrp would be a window of opportunity. Ripple is ranging from 6% to 8% right now at the time of writing this post. The price needs to cross $115.00 first. Once this is done then we can even being to discuss the next part. Until $115.00 level is breached I am afraid it is bearish for Ripple for the short term. There will be a lot of buyers on the sidelines who missed out on the massive 38000% return in 2017. With the current correction it may entice buyers waiting in the sidelines to pounce on any confirmed trend reversal. If that plays out then we could see a very big rally in Ripple in the weeks and months to come. The price action for Ripple is outperforming the Index. Since it fell below around $0.90 on Wednesday the price has increased by nearly 100%. I think there is a lot of optimism over the increasing number of financial institutions who are adopting Ripple's blockchain technology. I accept that only one major firm, MoneyGram, has implemented the Ripple token itself. However, I feel that it seems investors may well bet that others will integrate it in the future hence the price behaviour. At the time of writing, I would be looking for Ripple to break the $1.67 area. If it did then a long position could be considered. I have a feeling that another move upwards is coming in the short term at least based on current price action. It could be the move that attempts $1.67 level. Anything below $1.13 and it could try and attempt the recent low. Ripple is at a very interesting point. From one perspective you must remember that it has had extremely large gains throughout 2017 and especially near the end. Reported returns are around 38,000% which is insane. If anyone was good enough then they would have traded this with lots of leverage and made a fortune. With leverage the returns could have been far more than the reported 38,000%. From a different perspective, this could mean ongoing corrections as the valuation had raced far too ahead to insane levels. This may mean that there is the potential to short Ripple. The problem is that the 'Crypto Universe' is so mad that you have to put logic and historical chart patterns to one side. Ripple could easily try and go for its all time high of around $3.36 levels. All it would take is some positive news and traders could experience 20% and 30% per day increases here and there. IG were far too late to the party as usual. I am witnessing exactly the same mistake on Stellar which is 'ridiculous'. I would love to spread bet with leverage Stellar via IG's platform but I am unable to do so. When a new crypto becomes available on IG that means it is time to short! Litecoin and Ripple are good examples of this. Stellar has some real momentum which is great for those who want to trade it. Ripple is currently trading range bound with a downward bias. If it manages to cross the $1.35 level and stay there then I am going to start getting very interested. What makes Ripple particularly interesting compared to other cryptocurrencies is that it is centralised rather than decentralised. This is the opposite of say Bitcoin which is decentralised. It is up around 6% at the time of writing.